Check your grammar to perfection. 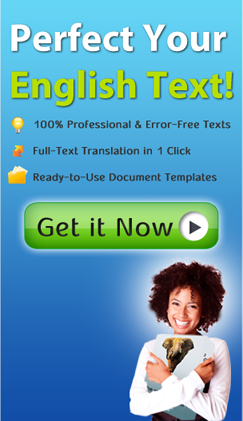 The most powerful grammar checker on the market detects and corrects a huge range of hard-to-spot errors. Any grammar error that is corrected by Writer also comes with an explanation that explains the grammar rule behind the error.Write confidently and learn from your mistakes. Enhance your sentences with alternate words and phrasing, including alerts for informal language. An easy-to-use one-click dictionary-thesaurus gives you instant access to definitions, synonyms, antonyms, and idiomatic phrases. Writer spell checker can detect typos and common spelling mistakes, as well as correctly spelled words used in the wrong context. Never be stuck for words - hundreds of letter templates are available to help you get started on any letter or document you need to write. Writer not only corrects your text - it gives you detailed information about your writing in order to help you improve. Making friends on Facebook or talking to your audience on Twitter? WhiteSmoke Writer ensures your message is loud and clear with correct grammar, spelling and style. Many leading bloggers agree that correct grammar and spelling is vital to your success as a blogger. WhiteSmoke Writer makes sure that your posts are always error free. English is the indisputable language of international business. Communicate more clearly with your customers and business colleagues with WhiteSmoke Writer. Persuasive arguments and correct grammar are essential in academic writing. WhiteSmoke Writer gives you an indispensable proofreading tool for all academic texts. WhiteSmoke Writer comes in several writing profiles to suit a range of uses. The key features are shared across all profiles - grammar checking and explanation, spell checking, style checking, and the dictionary-thesaurus. On this base, each profile has unique letter templates to suit the field, specialized text enrichment based on the type of writing, and unique dictionary and glossary entries. WhiteSmoke Writer is currently available in General, Business, Creative, and Bio-Tech profiles. All profiles are bundled together with a specialized multi-lingual dictionary in the Executive Package.